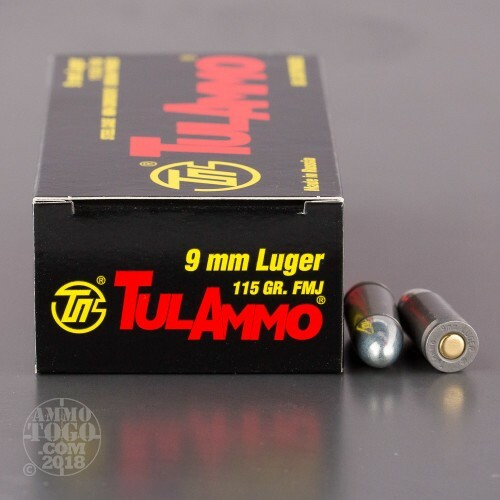 This is 9mm Luger ammunition, manufactured by Tula Cartridge Works. 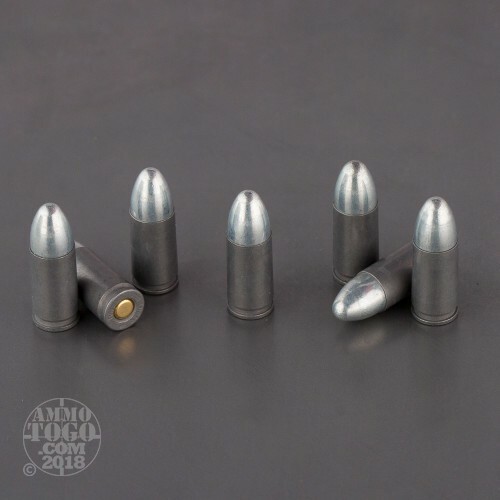 This bulk ammo case of 1000 rounds is loaded with 115 grain full metal jacket bullets, uses steel casings, noncorrosive Berdan primers, and is ideal for lots of outdoor shooting or training. This 9x19 ammo is reliable, consistent, accurate, and affordable, making it the perfect multi-purpose training round. And if "training" isn't your thing, then you will be hard pressed to find a more economical plinking round to show those empty soda cans who is boss. 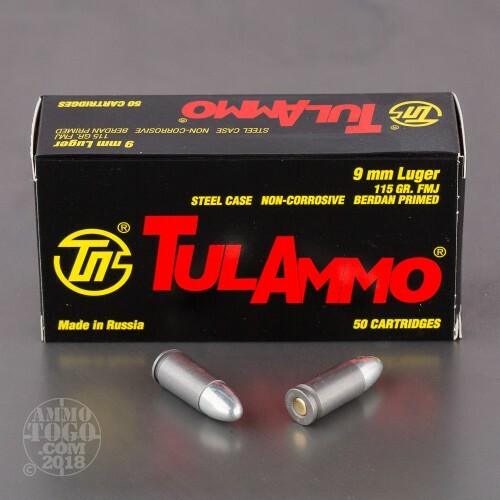 Tula is a Russian ammunition manufacturer, and is quite popular not only in Russia, but also in the US for their reliable and affordable steel cased ammunition. 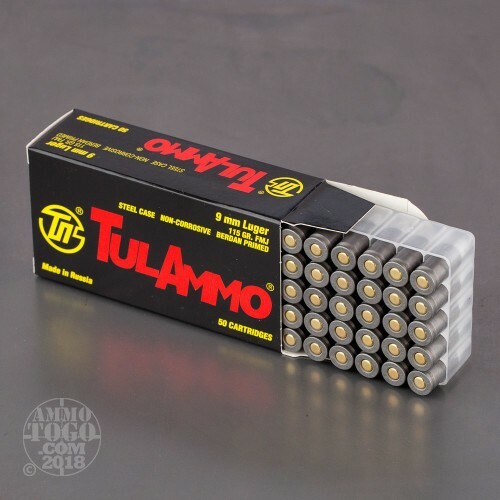 This ammo is non-reloadable, and is just what you need for your next trip to the range! Quick shipping and I found these rounds to be great at the range. I have have seen no differences between these rounds and the more expensive alternatives. The lower price enables me to shoot more and become more accurate. This will be my only 9mm once my other rounds are gone. Great shipping and service. Had a some shipping trouble, called them and they were able to straighten it out. Showed up two days after calling them. I will do business with them again in the future. Good customer support. Good value for the range! Shocked that it was this inexpensive and wasn't smokey....NO jams...clean after each shooting and no problems!! Shopped around and this was the best price out there. The turn-around time on my order was same day. The packaging was discreet (slight extra cost). I've used 100 of the 1000 rounds with no problems whatsoever. Very happy with all aspects of the transaction. Really love these rounds. All my guns eat it SR9c Ruger/ Highpoint carbine also my Chippia M1 like most said cleaning is a must after but the non issue is worth the elbow grease. Cheaper is ok in my books. Bought 500 rounds. First day at the range almost immediately had a problem with rounds jammed in the magazine of by Beretta PX4 Storm. Had to take the magazine apart. Will try in some of my other pistols; hope they feed much better. I have used these rounds in my walther p99, glock 17 and my springfield xds with no issues at all. Dirty but reliable. 1000 rounds with no major issues. Had to clean my bore aggressively but with some elbow grease, a bore brush, and some cleaning solvent it was worth the saved money. ordered two thousand rounds on Saturday and it was delivered on Wednesday.you can not beat these guys for service. Guys This company has to have the best service anywhere. Very affordable ammo. Just shot 50 rounds through my XDS and had 1 misfire and 50 rounds through my M&P with 1 misfire. I've shot 1,000s of rounds through my M&P using "Blazer" and never had a misfire. Hoping this doesn't continue or it will be like throwing out just shy of a 1/2 box of ammo. posted on 7/13/16 by Peter B. My indoor range allows steel casing, but does not allow steer core ammo. The description did not mention steel core. Would have purchased another item if I had know this Tulammo was steel core. It also sticks in my magazines a little bit. I have experienced 1 fail to feed per 50 rounds after shooting 200 rounds through the PX4Storm So only 2 stars. Shopping experience great as usual and free shipping for Father’s Day made it the best deal around. So far I’ve shot 50 rounds in a FNS 9c, 50 rounds in a Beretta Nano, and 50 rounds in a Ruger P89 and did not experience a single problem. I had read some poor reviews about the non-copper casing so was a little apprehensive but so far so good. This ammo does leaves the gun a little dirtier than other brands but no big deal there. Very happy. This ammo is perfect for the indoor range - who cares where the casings fly? It's cheap enough so you can just shoot it and forget it. Groupings and performance seem to be consistent and reliable. Shot 1000 Rds no problems ordered 2000 more. Great for practice. So far, I have fired 50 rounds of the 1,000 rounds that I purchased from Ammo to Go. I shot the rounds through my new Taurus PT709 Slim pistol. All rounds cycled perfectly and were accurate (hitting two-inch circles at 22 feet about one third of the time). The remaining rounds landed close to the circle most of the time. No malfunctions of any kind in a new Walther PPX. Put 400 rounds of this ammo at the range through the PPX to "break in" my new Walther. I had no problems and found it to be accurate and reliable. I also ran this ammo through a new Hi-Point 995 carbine. I had one FTE in the fifth ten round magazine and no more problems of any kind after firing another 300 rounds. I know I haven't run a lot of these rounds through these guns yet, but I am really satisfied with the performance in these guns so far and recommend trying Tulammo 9mm in any gun. I have fired several hundred rounds of this Tula ammo through my Sig P250. I have experienced zero problems with these rounds. They load into my high cap. mags with no issues, and I have noticed no adverse impact on the receiver or the breach. The only negative I have seen was that one range that I shot at would not allow the rounds because the bullet has a steel core. However, they cause far less of a cleaning issue than any of the range reloads I have fired. They work great in my Walther PPX. No binding, No FTF or FTEs.I bought 10 more boxes. I Have shot this steely stuff through just about every gun in the shop, it may be cheap, but, it never fails. well, had one case hang up in a 5.56. Only down is some indoor ranges do not allow as they have a central collector that boxes, sorts, and sends out the brass for reloads. No steel. Great ammo! 1 misfire of 1000. Not bad at all. I had no issues with keeping in the magazine for days. My handguns are fine after using it. Supper happy. Outstanding and cheap ammo. Keep it cheap! I have shot thousands of rounds, both for fun and as an instructor. I keep this stuff on hand by the case for plinking and range training. We always end a range session with carry ammo (Brand Name JHP's). This stuff is a bit dirty, but often performs better (accuracy-wise) than Remington/UMC target and Winchester White Box target (not every lot!). For those that did not know this ammo is Bi-metal, sorry, www search or Tulammo website would tell, please research what YOU BUY AND USE. Also, for those that cannot fully load a magazine, please use a loading tool or have your magazines checked by an actual GUNSMITH or factory warranty inspection (free from most manufacturers)...this will fix most problems. If you have out of spec ammo, contact the manufacturer, most will make ammends or help you out. Works fine for targets, one jam in 350 rds in a glock 17. Shot these in Ruger LCR 9mm, the spent casings expand after fire and will not eject the moon clip from the cylinder. Fired three cylinders, same results. Good thing I keep a cleaning kit in the range bag so I had a cleaning rod to tap out the casings. Other than that, they fired fine. Perhaps a different pistol will like these better than the LCR. My wife and I have shot thousands of rounds of this Tula and similar Wolf steel case lacquer or polymer coated steel case rounds through our Kahr PM9, Beretta FS, Ruger PC9 and other handguns. Out of these thousands we experienced 2 misfires, excellent feed, no jamming, observed no significant wear on rifling and find the accuracy acceptable for target practice. I clean the guns extremely well after every trip to the range. For the price this ammo can not be beat for inexpensive target practice. I highly recommend it. I rated it 5 stars because of the price and I only use it for target practice and plinking. Not self-defense. Steel casings are stated and pictured. Not as clean as brass but no problems and economical. Clean your gun after using and don't leave rounds loaded for any length of time. Store in dry area, low humidity.